Finding the home of your dreams isn’t always easy. Nowadays, most people start the process of looking on the internet to find information to support their homebuying decisions. But with so many property and real estate mobile apps available, how do you know which one has the most accurate and timely listings? It’s imperative in today’s crowded market that homebuyers use up-to-date apps with complete property details. Unfortunately, with many apps, there’s a disconnect between which homes are actually available to purchase and which homes are seemingly available. Often, many of these homes have already been sold, sometimes weeks prior to the “new listing” alert. In addition, many public property apps and websites, like Zillow and Trulia do not have all the current listings that match your personal search criteria. In fact, sites like these only provide 60-70% of the MLS listings and have incorrect pricing on more than 50% of their displayed listings. Also, your information can be sold to realtors who pay a fee to gain access to your search information. That’s not cool. It’s time to start searching for your home like a real estate agent. 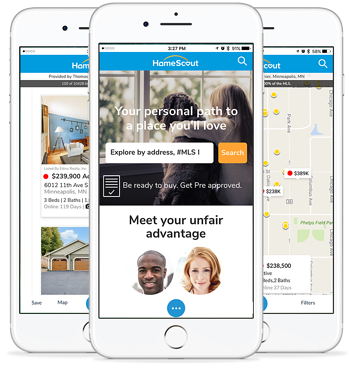 HomeScout® is the best way for you to search for houses because it’s free, convenient and private (so there’s no annoying calls or emails from third parties trying to get your business). If you’re working with a specific real estate agent who you’d like to connect with through the app, you can do that too. That way you’ll be able to share the houses you’ve found with the agent of your choice. You can also schedule homes tours and get notified when a price drops or new photos are added. It’s the most reliable way to save and track your favorite properties, and to research homes you may be interested in purchasing. Sound good? To start searching for homes in your area, download the HomeScout® app from Google Play or iTunes.